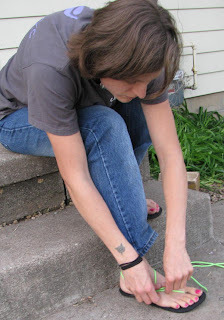 Barefoot Angie Bee: Invisible Shoes part one. The Kit. Invisible Shoes part one. The Kit. Here is the thing, I am a barefoot runner first and foremost. My preferred foot wear are my nekkid feet! I have worked long and hard to condition my mind and my feet to run barefoot and have reaped the happy rewards of a love of running and no more injuries. I have ran on many terrains and many temperatures. I thought in the beginning when I was newly full of passion that I would be a purist and only run barefoot forever. I still have a passion for barefoot running however I now see shoes, the right shoes that encourage proper form and compliment my feet as they are naturally, as a tool I can use to keep me out there running under certain conditions that barefoot running may not allow. I asked Steven at Invisible Shoes.com to pretty please let me try a pair so I could check them out and then write a review for this blog. He was super kind to ask if I wanted to have him make a pair for me or if I wanted the kit to make my own. The kit for sure! How cool is it to make my own shoes and Invisible ones at that! Steven is a member of the Boulder Barefoot Running Club. 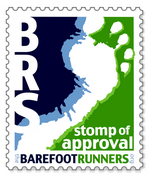 It is an incredible force in the barefoot running movement. This is how Invisible Shoes came about. After making huaraches for most of the BBRC regulars, it was founders Michael and Jessie (of Run Bare) who said, “These are great. 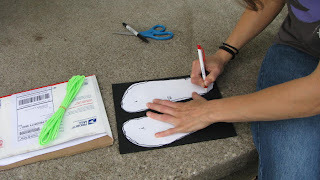 You should make these for everyone!” and Invisible Shoes was born." More here. For a little background on Huaraches shoes. If you have read Born to Run by Christopher McDougall (which is a fantastic read for anyone) you will have heard of the Tarahumara Indians of the Copper Canyons in Mexico. They run in a very minimal sandal. They don't just run a casual 5k either. They run as part of their lifestyle and huge distances that are shocking to our padded and cushioned way of running here in this country. These Huarache sandals are typically made with old tires and leather straps. They run on rugged rocky terrain and love frunning from the time they can run as young children long into old age. 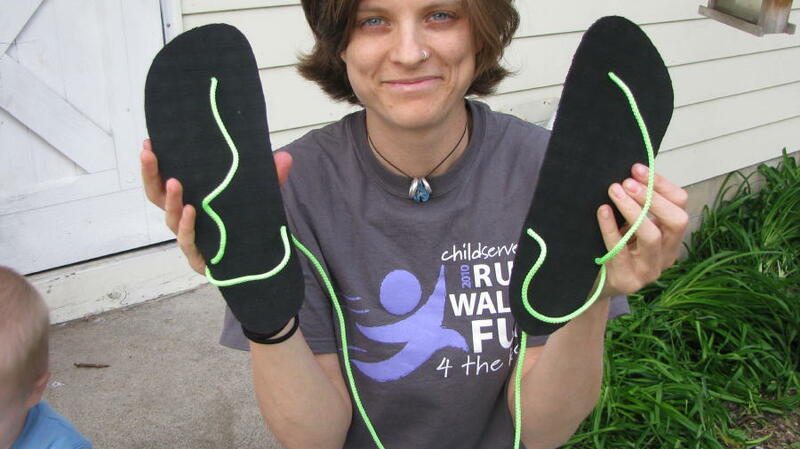 Steve has duplicated this shoe concept with Vibrams for the sole and bright and happy colored laces. These are my pair upon completion! They were super fun to make! I can say that I have made my own shoes. That is very satisfying in its own right! This is the beginning of my Invisible shoe journey in photos! Happy girl ready to get started! 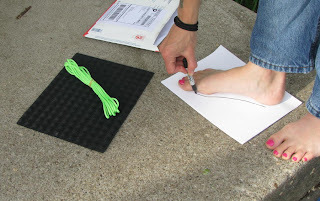 First thing to do is check out the wonderful Vibrams material and bright sassy laces! Then to start tracing my foot with marker. 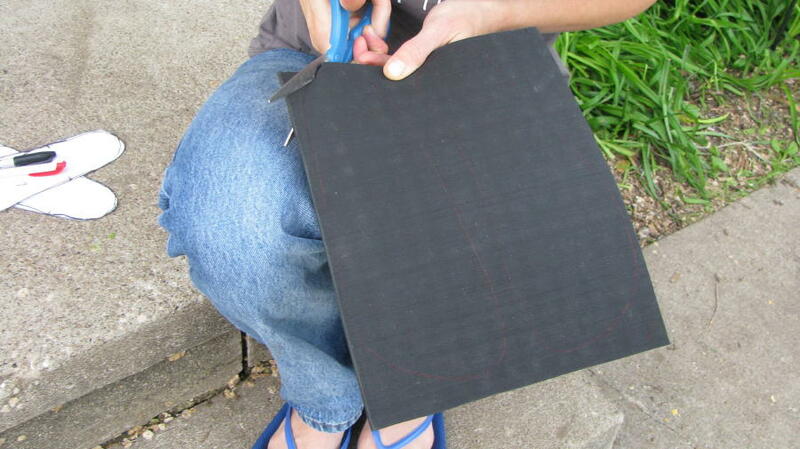 The first tracing is just like tracing your hand or foot when doing school crafts as a child! I was kept company by some very cool cats! 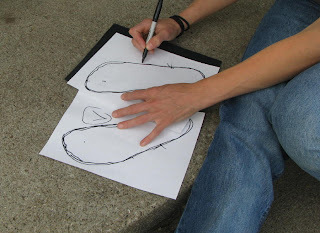 The next step is to even out the tracings of my feet. Its best to make them a little bigger since its easier to take some off instead of finding at the end that you need more material! Before cutting out, the directions say to mark the holes for the laces. You can see where I marked my holes. 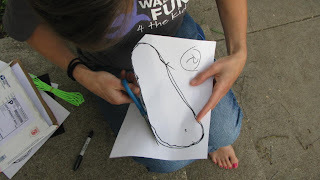 The key to this step is to make the toe hole closer to your 2nd toe. When we run there is a tendency to shift to the inside of the shoe. The lace closer to the 2nd toe keeps the shoe in place better. The other hole marks are made on the north side of your outside ankle bone and the south side on the inside of your ankle bone. The directions at Steves site are fantastic and very easy to follow!! Here are the patterns for my shoe soles. In the end I didn't use the marks for the holes on my pattern. 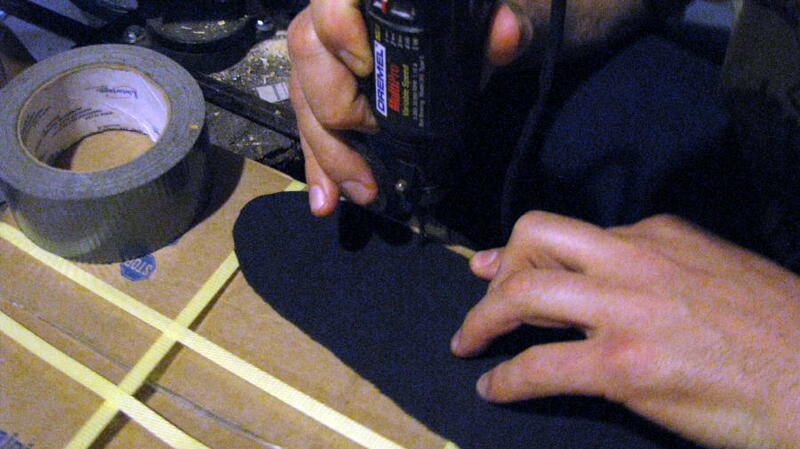 I marked them directly onto the soles when I was ready to drill out the holes. Now its time to transfer the pattern to the Vibrams material. I just used a black ball point pen. Yay! I was super curious about cutting the Vibrams material. It was easy enough with just regular household cutting shears. I thought I would need something more heavy duty but these worked fine. You make very short cuts. and two, oh the things we can do. I am also about to be whacked in the back, lovingly of course, with a stuffed dog! Here you can sort of see where I am making a mark for one of the side lace holes. 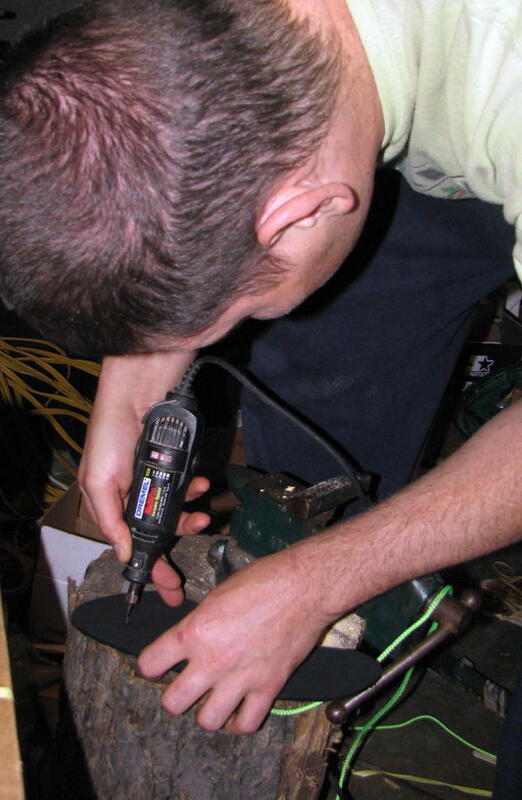 So, I can use a drill and a Dremel and various other power tools. I asked where the drill bits were but did not have the heart to squash the hubbies excitement at being able to be clever! So I let him be his super clever self and Dremel out the holes for me which as it turns out worked really well! You can also use a leather hole punch. Here is my super clever and handsome hubby. 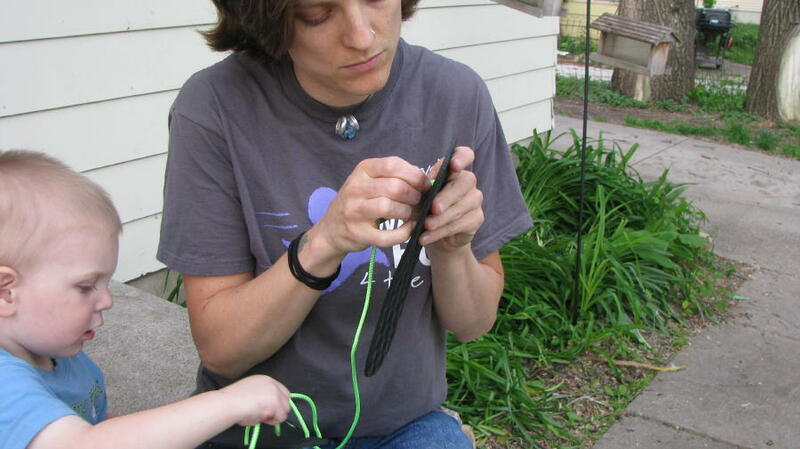 Here I am starting to string the laces. You begin by going down through the toe hole and then making a figure eight knot. 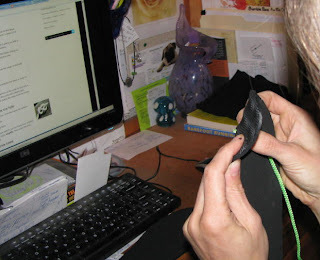 I dig this photo because you can see the instructions page on my monitor and the pretty figure eight knot. I was wondering at this point if the knot would be uncomfortable to walk on. It turns out you don't even notice its there. 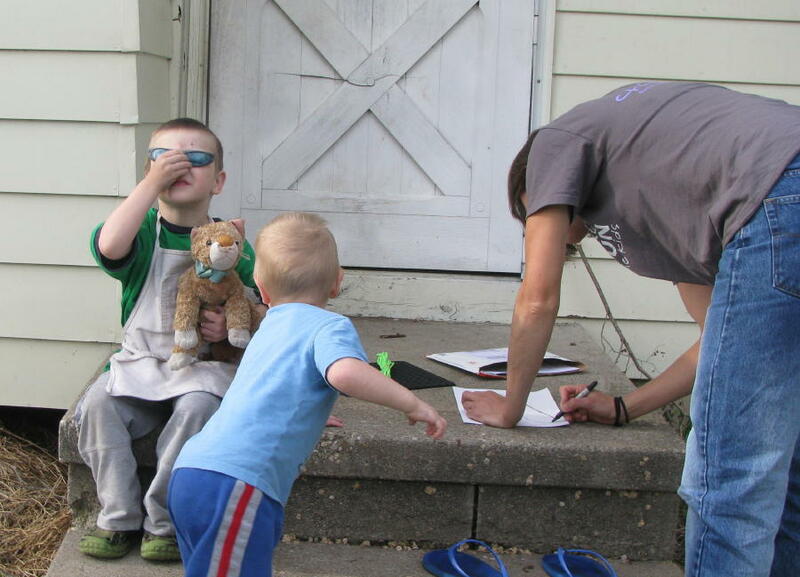 Getting some help from the littlest spawn. I did end up relacing the side laces since I missed a step. I was supposed to go around the lace that goes down on the outside hole before crossing over to the inside hole but this is the only photo I have of them finished like this. 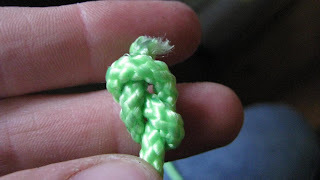 I had to watch the video a few times to learn how to lace them but it was pretty simple. It more a matter of adjusting the lacing to my particular foot. I love how much control I have over how they fit on my feet. Most shoes either fit or the don't and there is not much for adjusting. Here we are again! These shoes really are as close to being barefoot as you can get! The added protection is nice and yet there is not much for padding at all! I love how my toes can splay and move about naturally. If you are not used to going barefoot or are new to minimal shoes, do take your time. You will find new muscles in your feet and legs that you probably did not know you have! 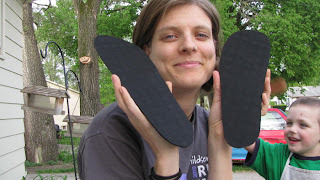 You will love wearing these Invisible shoes! Next up will be part deux when I start to run in them. I can't wait to get on some different terrains. I find all of this so interesting! Very cool. Good luck on your first test run! Also - I am envious of your pretty toes! My first barefoot trial was met by some amazingly painful terrain. I'm sure there is a term for it, but it was asphalt with large bits of rock in it. The asphalt had also cracked and gotten really rough to drive on. What told me to go that way? No idea. I may consider those. On the other hand, couldn't I just glue some rubber onto the bottom of my feet!? 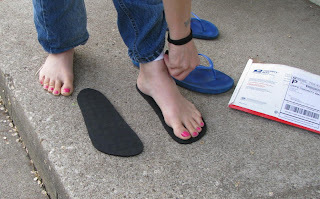 I remember these "sandals" once that just stuck to the bottom of your feet; guess they didn't make it but those made me think of this. I'm envious of the toenails, very pretty :). Interesting! Can't wait to hear how they work on a run. Coincidence? I think not. Your shoe laces are matching your compression socks. How cool is that! I am very curious to hear what you think of them especially on trails. My gripe with many minimalist shoes on muddy trails is that they have horrible traction. Looks/sounds like a fun project. And you picked a good color for the string! Those things look pretty cool. How often do you have to re-do your toe nails with all the barefoot running? Perhaps a weird question but I'm curious. You are on fire with posts on The Road. 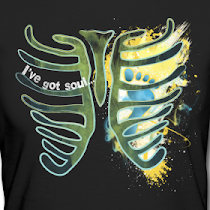 One more and you qualify for the free tee. Thanks for reading I appreciate it. Hey there Angie Bee, It is Scooter AKA LavaRunner. Look forward to hearing how these work out. What do you think about the knot between your big and index toe? Does it look like it might pull through or wear out on the road? This is my biggest concern with the Huarache type sandals. Good work! cool! I'm interested to see how they work for you. I live in my Birkenstocks year round, that's as close to barefoot I've gotten. I do them about once a week or maybe once every two. Touch ups here and there. Less often when I was wearing shoes since there is nothing to rub the polish off like the end of my shoes! The barefoot running has improved my feet as far as how they look. I had callouses when I wore shoes and now I don't. The road acts like a pumice stone. My feet are dirty often but no more than just wearing flip flops so much. 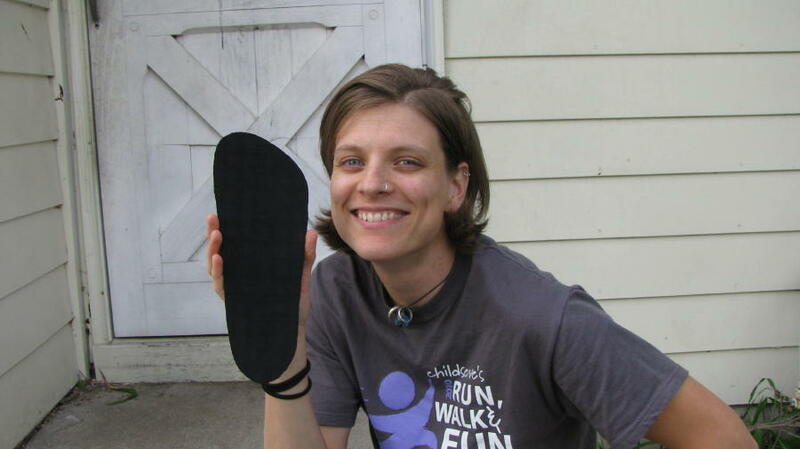 I take better care of my feet now that I run barefoot and I have much more muscles and my arch is a bit higher. So I SWEAR I am not a foot freak. You have great feet though. ugg that sounds so weird. I WALKED barefoot on Saturday a distance of about .25 of a mile and I looked like I was walking on glass. I thought of you the whole way. Thinking how the (*^%#%* does Angie do this?!?! hahaha that's SO cool!! they look great, how fun! btw, i like your hair! Those are awesome. Once I can actually run again I am getting me a pair. I can't wait to hear how your running goes with them. To cute and CLEVER! 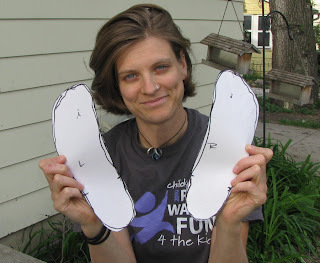 Those are perfect for an intro to the barefoot world! Neato! I haven't tried running in any minimalist shoes yet, just barefoot and Crocks for short bursts of gravel and roadside trash. These seem like a great idea. i LOVE building things. We have an IKEA in Phoenix where we got all of our furniture and i had a blast putting it together. take lots of pics on the first run! Wow could my toes look like that if I went barefoot!?!?! Take lots of pictures on your first run. I can't wait to hear how they do! That is such a cool kit. It is nice to be able to say that you made your own shoes! I'm curious about the laces between your toes. Does it rub at all while you're running? I know you just didn't want to copy Jason and get hot pink :) Looks like you were having fun! It seems everywhere I search on the internet for something along the lines of barefoot running, you pop up. 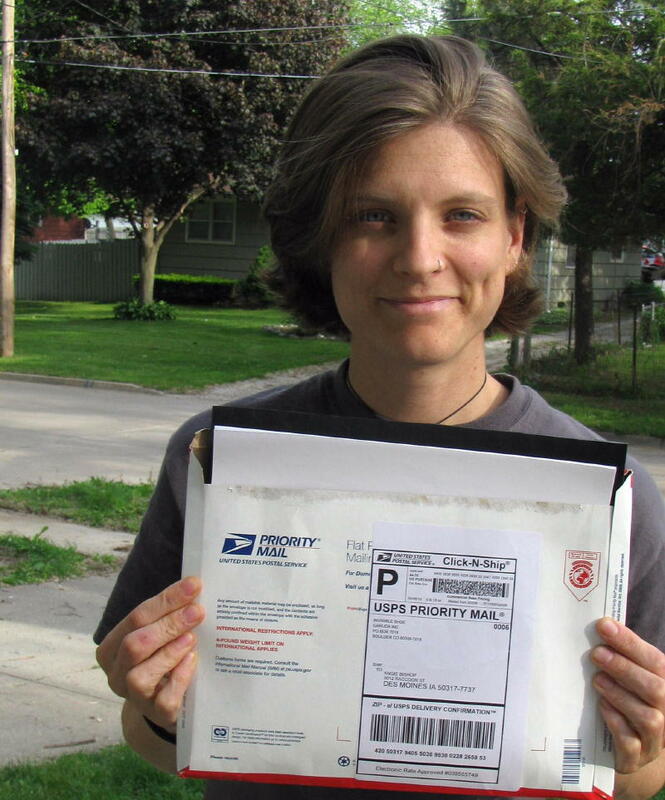 I was looking for a picture to put on my page and was like, OMG, there she is again! I just built those sandals last week and started blogging about barefoot running a few days ago. Still don't have any followers, but soon it will happen! 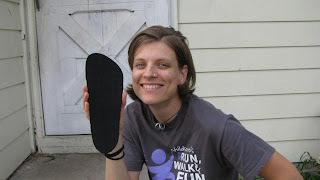 Keep up the wonderful blogging about barefoot running!